It was great to return to Christ Church for my fourth visit. It’s a really lovely place and always a joy to return, especially to mark the start of the 2018 school events. 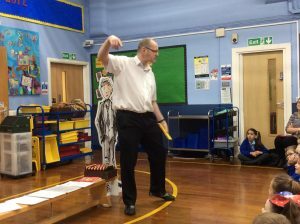 The morning started with an author assembly. It had been sixteen months since my last visit so I had plenty to tell the children. 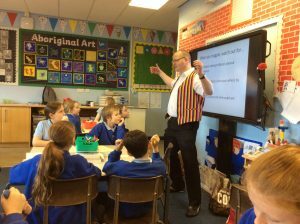 They listened attentively as I explained Eric’s latest adventure and even put on the storytelling waistcoat to share one of the Tales. A fab forty minutes! Next up was a writing session with Year 5. The hour whizzed by as we investigated ways of creating a nasty character for one of my Tales. The children’s ideas were ace and I left them with plans ready to begin their first drafts. 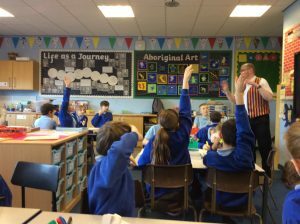 After catching my breath, I joined Year 6 for their writing workshop. 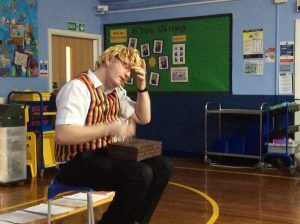 We repeated the character study and the pupils rose to the challenge. Their ideas and enthusiasm had me buzzing with writing energy. I can’t wait to read examples of the first draft. I thoroughly enjoyed my morning at Christ Church and would like to thank Mrs Malley for organising the visit and promoting the signing. I’m already excited about returning in the new academic year.